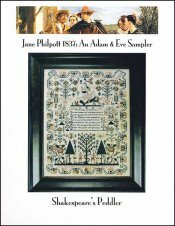 Jane Philpott 1837: An Adam & Eve Sampler [E6783] - $25.00 : Yarn Tree, Your wholesale source for cross stitch supplies. Cross stitch pattern by Shakespeare's Peddler. "Adam & Eve Sampler" features a saying stitched in the middle of the design. Around the saying you will see trees, flowers, animals, etc. stitched. Towards the bottom of this design is Adam & Even standing next to the tree. Stitch count is 290 x 390.